Is a high price worthwhile for your engagement ring? Many couples are curious if they can afford Tacori settings prices when they consider buying engagement rings. Since Tacori settings are handcrafted they do tend to cost more than a ring that has been created for the mass market. Tacori is a company that is known for the delicate settings and surrounds that it creates. Each piece is hand tooled. This produces one of a kind jewelry item that has all of the quality found in old world craftsmanship. The artisans, and they do consider themselves to be artisans, are very detail oriented. The pieces are created to be intricate and stunning to the smallest detail. Each piece is stamped with the Tacori name on the inside of the ring to guarantee authenticity. Tacori jewelry was made a household word on the television show, Desperate Housewives. Once the jewelry began to be featured as part of the characters' wardrobes, American consumers were not far behind in the desire to own one of these works of art, and Tacori engagement rings are rising in popularity. Tacori settings are produced in either platinum or gold. Platinum will cost more than the gold but it will also stay more beautiful and last forever. The prices are also determined by the intricacy of the ring as well as the diamonds that are set in it. There is one thing to keep in mind if a jeweler offers you a "good deal" on a Tacori ring he has in the store rather than special ordering it for you. The company routinely sets cubic zirconias as the center stones in the rings that are used for display. The difference in the thickness of the girdle of a diamond and a cubic zirconia is minute but it is enough that when the cubic zirconia is replaced with a diamond the diamond will continuously be loose. Also, consider whether or not you want to have the diamonds encircling the band. A ring with continuous diamonds around the band cannot be resized properly and the pattern will never be the same. Believe it or not, you can find Tacori rings for less than $1,500. Don't plan on a lot of embellishment but if you have your heart set on Tacori and your budget is limited there are a few rings you can look at. Several designs of diamond wedding band have low carat total diamond weight. The diamonds go halfway around a medium width band and the costs don't add up as quickly as more elaborate rings. A Crescent Silhouette engagement ring is classic Tacori. It has .05 carats total diamond weight inset in the shank with up to a one carat center stone. The center stone is not included and must be purchased separately. If you love baguette diamonds a Tacori ring may be what you are looking for. Small baguettes are set in the side of the ring with a setting for a one carat center stone. This is very traditional and elegant. Yellow gold accents on a platinum mounting make this unusual engagement ring from Michael C. Fina so beautiful. Small side stones add elegance to the design. Many Tacori settings prices fall in this category. There is a much bigger selection of settings, although you need to remember that you will still need to buy the center stone and have it set. That could add several thousand dollars to the total cost of the ring, depending on the stone you choose. This beautiful 18-kt gold Tacori ring features round, brilliant cut diamonds along a twist shank leading up to the center diamond of your choice. For the look of a large diamond with the price of a smaller one, this beautiful setting from Arthur's Jewelers may be what you are looking for. 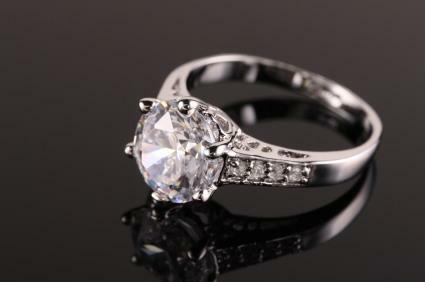 Brilliant cut diamonds are set around the top of the setting and they will make the stone you choose look much larger. The stones are .25 carats total weight. Of course there really is no limit to Tacori settings prices. Depending on the metal used, the detailing of the design and other factors, the rings could be very expensive. An emerald cut center stone is set off by square, channel set diamonds as well as pave set diamonds which accent the details. Even without the center stone the total weight on this ring is 1.63 carats. A diamond embellished Tacori engagement ring with crescent shaped edges and diamonds all around is one of their more expensive engagement rings. Total weight of the round diamonds is 1.60 carats and the setting will take up to a 1.5 carat stone. When you buy an artisan ring like Tacori you are buying an heirloom engagement ring. Don't try to cut corners or to get a great deal on the ring because ultimately you may find that you did not get a deal at all. Always look for the Tacori stamp on the inside of the ring and buy from a jeweler that is recommended by the company. You will have a lifetime to enjoy the engagement ring and there is no value that can be put on that.